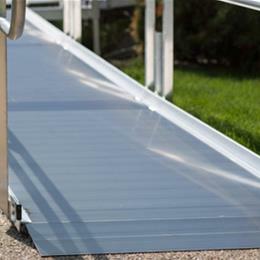 When connecting a PATHWAY® Modular Access Ramp to a platform the innovative connectors provide a smooth (bump-free) ramp-to-platform transition, eliminating trip hazards. 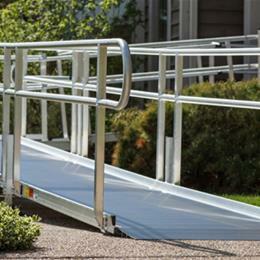 The handrails feature a gripping area that is 34" above the walking surface. Their brushed aluminum finish is architecturally designed for a clean, modern appearance. The PATHWAY® Modular Access Ramps have no hardware that protrudes into the walk area and all ramps feature an extruded slip-resistant surface which will not wear down. 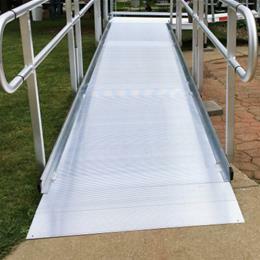 The self-adjusting bottom transition plate on the PATHWAY® Modular Access Ramps provide a smooth ramp-to-ground transition on most surface types. Available in sizes ranging from 11” to 56” the adjustable stair provides an alternative access point allowing for convenient entry for everyone that accesses the home.